"If you want to get parts made with a CNC machine, forget about trying to learn how to use AutoCAD, FreeCAD, or SolidWorks. They are ridiculously complicated. With the free software from eMachineShop, I was able to get my first part designed and delivered in eight days! That was two years ago. Since then, I've used the software to design increasingly complicated parts." "Thank you for the great job you have been doing for me over the years fabricating a lot of the parts I used in the manufacture of my RC model sailboats." "I was totally amazed how your company delivered CAD software linked to production machines and immediate cost quotes. I still remember the first time I placed an order and it arrived exactly right... it was like a fairy tale. Sure made designing my cot and growing my company much easier and faster." "I can definitely say the free CAD software provided worked excellently and the whole experience working with you guys was straightforward and quick." "Over the last two years, I have submitted numerous designs created using eMachineShop's CAD software. I have been completely satisfied with every order. I have and will continue to highly recommend this company to anyone needing machining services. I spend most of my time in Southeast Asia, so it is a real convenience to be able to do design work there. This year, in 2016, I completed an entire project remotely from Malaysia and Thailand. It is difficult to find words to adequately express my total satisfaction with this company." "I have had emachineshop do several jobs for us over the last few years. Alex and the team always do a great job, on time, and are reasonably priced. What more could you want from a vendor? It is a pleasure working with them. TJ Suiter"
"Thanks for checking in with us. And we are very pleased with how these parts turned out." "I am completely satisfied with parts that have been machined for my projects." "GOOD STUFF! I can work anywhere on my own time and produce the parts I've dreamed up during the day, I have no complaints. EMachineshop where have you been all my life? A+++"
"Little known fact, in our string of 5 world championships, CSSN racing used parts crafted by eMachineshop. Great quality and service. CSSN Racing"
"First let me say that I received the pieces today and I'm incredibly happy with the fidelity...great work!" "I've been building robots for a while now and always dreamed of building one of my own design. After doing my research I went with eMachineShop.com. I had 52 parts built in T6 Aluminum and powder coated gloss white. Everything came back perfect! The powder coating gave it a professional look I was going for. I just place another order this week!" "When I decided that I had to have custom brass, floor outlet covers made because I couldn't find any that met my needs, I contacted 3 local machine shops, as well as designing/pricing it thru eMachineShop. The eMachineShop CAD software was easy to learn/use & the instant pricing for different options is fantastic. The eMachine quote was HALF the price of the lowest local quote & indicated quicker delivery!! My order from eMachineShop came exactly when quoted & as quoted!! I am very satisfied & would use them again with no reservations!!" "This is a fantastic tool. I am a complete novice when it comes to cad design. But within a very short period of time and using the tutorial I had my first part on order. Thanks so much!" "I was very impressed with my order. I hope that the injection molding service is as good." "eMachine is FANTASTIC! In designing my part whenever I encountered a problem with the CAD program they were quick, helpful, and professional. I thought companies that provided this level of customer service had all gone the way of the dinosaur, I'm thrilled to see that I was mistaken. As for my order, when I opened that box it was like Christmas morning or My birthday, the part was beautiful and was not only exactly what I ordered, but arrived a full 3 days before the date that was quoted! My only regret is that I opted not to have it powder coated, I would not hesitate to use their services again." "I could not have been happier with the quality of the parts I had emachineshop make. I was skeptical at first and afraid the parts would not be as nice as I was hoping. But they where exactly what I was wanting!" "Designed a new bracket for my jib in a matter of minutes, ordered it, had it within about two weeks, and it's perfect! I am beyond impressed with the production speed and quality! Thank you, thank you, thank you! I'll be ordering again in the future, for sure!" "Unbelievably accurate and fast. Using their CAD software I easily designed a very unusual part required for bleacher fabrication for my son's Eagle project. They made the parts and delivered them in a third of the time other places were quoting me and for far less money. They are AWESOME and are HIGHLY recommended." "First off I was completely satisfied with the quality of the parts I recieved. I was more impressed by the business model of this company. I work for a large manufacturer of heavy machinery. I was telling my co-workers (other engineers) about my experience with this company and they were shocked. One of them has direct experience trying to get unique parts out of our fabrication shops. He said I would have spent more time and money trying to get parts through our own company. In short Im very impressed with the service you are providing." "I've just received probably my 8th small order in the last 6 months, and shipped off two more. You guys have never missed a date or sent me a part that didn't exceed the manufacturing tolerences specified. Not one bad thread! You've sped up my project time AND reduced my costs. This is an incredibly valuable service, keep up the great work!" "I've never used any CAD software before, but I downloaded and installed the software. 15 minutes later, the custom metal piece I needed for a necklace pendant. The software's price appraisal was near instant, and it gave me tips which helped me reduce the price by 100%. It's a great program!" "In our company we have used many software packages like Auto Cad, Pro E and Solid Work. I have found all of them very complicated. I tried to use them many times but never succeeded. eMachineShop provided the first time I could get a complete design and provided automatic design analysis. The software is really very helpful. Thanks." "I LOVE the CAD software - we have SolidWorks but it's too complex for me to learn in the time I have (only one person in the company knows how to use it). Google Sketchup pro was a total waste of time. With your software I made a simple bracket with a 90 degree bend and four precisely placed holes in under 5 minutes from scratch with no previous experience. I am IMPRESSED! It's SO great not being totally dependent on our slow, slow in-company Solidworks guru anymore!" "I must tell you that after almost 20 years of computerized CAD work, your software offers the simplest interface I have ever seen. With minimal practice you can create just about any part needed. I also found your web forum to be extremely helpful when I had a question that I could not solve on my own. Your knowledgeable techs were quick to give concise and accurate responses. Well done!" "I received the parts I ordered and I am just stoked! They are exactly as I expected and will work perfectly for my project. Finding a machine shop to make the parts I need has been a big obstacle to my inventive efforts because the parts are often small and I don't need large quantities of them. This is my first transaction with eMachineShop and I am very happy with how it worked out. A big Thank You!" "When a bracket of my shower door broke, I was looking at a complete enclosure replacement, north of six hundred bucks, since the model I had was not manufactured anymore. In desperation, I designed a replacement bracket using my qCAD software. When I was looking for somebody to machine it, I found your company on the Internet and downloaded your free CAD software. It imported my dxf file with no problem at all and was very easy to use, especially after watching the tutorial videos at your WEB site. The 3D view was great too! No faxing paper drawings, no endless phone conversations as to how the drawing was to be interpreted. Your software let me select the proper material and even gave me the final cost, including S&H. It was extremely helpful to be able to figure out cost implications of design choices precisely, even before ever contacting the vendor. The cost-saving hints the software gave were very helpful too. Your software also promised a processing time of fifteen working days for the most cost effective option I chose. You shipped within three! The parts were well within tolerance and fit precisely. While any one-of machining has its price, I saved over five hundred bucks using your services, even though I also ordered a spare part, just in case it breaks again after another twenty five years :-)... You guys are awesome!" "To whom it may concern, I just received my initial order (test run for one prototype) of 55 pieces. The machining is excellent, the parts are absolutely perfect. They fit together exactly as I had planed and designed. The machining stayed well within the tolerances allowed, and the parts turned out just as I had hoped. I have already assembled the received parts into their respective sub-assemblies and not one flaw. Thanks again eMachineShop, I will most definitely be using you again for the next phase of my prototype. Sincerely, Victor T."
"I am in awe at the usability and intuitive interface. Great work, I can't wait to build a few prototype fixtures. I was in need of a CAD program for a new netbook I recently purchased; was at home and needed to flesh out some ideas. One quick download, and in less than 15 minutes I had a good working diagram. The eMachineShop was perfect for my needs. Thanks again, great product!" "A friend of mine said that he has tried various CAD programs over the years and none has been sufficiently easy for him the master with the exception of the software from emachineshop.com. He swears by it, and says that for the first time he finds himself going directly to the drawing software rather than pencil and paper." "I bought some Sparco racing seats for my BMW Z4 but i could not find any single company that made a custom seat bracket for my car. I found this website and at first was not too sure what would become of it. I downloaded the CAD software and was amazed at how easy it was. Being that my brackets were mostly square with 4 bends, i finished them and ordered them for a very cheap price. They recently came and i was truly amazed. They were right on the spot and perfectly made. I even got an awsome ruler with my brackets. I was able to install my seats and i am very, very satisfied." "Absolutely impressed, spot on, exactly what I designed and ordered! I will be ordering again!!" "This is my first time using CAD software and in a few minutes I designed what I needed. The software is extremely easy to use. What a great tool. It took me about 5 minutes to figure out how to draw what I need. The ability to change tooling, materials, etc. and reprice so quickly is amazing. Also most companies I contacted would not even respond to my request. I am a part of a local inventors group and I will pass along your company as someone to use at our next meeting." "Today I received the second of my two orders I placed with emachineshop.com. I just wanted to let you know guys know how pleased I am with both the quality of the work, the expeditious delivery, and the ease and sophistication of your design tools. I will certainly use emachineshop again for our other needs in completing our experiments here at Harvard. The bonus machinist's ruler included with the order was a great finishing touch!" "I was very impressed that your software works under Wine in Ubuntu as well as MS operating systems." "I received my 3D CNC machined adapters today. They were spot-on with the design and drawing. I would have rather had them done at my Brother-in-law's shop but even he was impressed with the simplicity and ease that eMachineShop gets the job done. He was skeptical that they could be done so economically. Thanks, we will see how fast the demand gets order # 2 rolling!" "I am not very well versed in utilizing CAD programs but I found your site and information to be the best that I have seen so far. With a minimal amount of tutorial time I was able to design a bracket and look at the 3D version which allowed me to see a potential problem with the design. You folks are definitely one of the most valuable sites I have ever found!!" "Thank you. I hoped that there was this kind of service on the net and there you are. And it wasn`t hard to find you. The term "sheet metal online order part" did the trick." "I did the attached drawing in under 5 minutes. Great... The drawing is very easy, intuitive, and enjoyable. I whipped up a design and got a quote in under 60 seconds!" "We are so impressed with your site!" "Quite easy to use. Within only about 10 minutes I had it downloaded, installed, and had designed and priced a brass cog with 32 teeth, 1 inch in diameter and 1/4 inch thick. The quote was immediate." "Just wanted to write a note to tell you how satisfied I am with the service you provide. Attached is a picture of some parts I ordered, laser cut Stainless Steel motorcycle chain adjusters. Product was exactly as ordered. I am very excited about using your service for future orders. I see a tremendous potential in the service you provide. Your system for designing and ordering custom made parts is so much better than anything I have ever seen that nothing even compares. Your prices are extremely reasonable and the whole process so efficient that it's almost hard to believe... Whenever a service of this quality and efficiency is offered people will take notice. I congratulate you on your innovative thinking and application of modern technology. It must be exciting to be on the forefront of a new concept in manufacturing. I wish you the great success your company deserves." "You are professionals. This was my first time using emachine shop. I really appreciated your work. I expected my parts for the end of December, I received them three weeks before. The quality is a lot better than I thought. Quotations are very precise. Thanks a lot." "I really really like your methods of designing and purchasing machined products. Your software made it amazingly simple for me to do a simple design and purchase it. I found your site, downloaded the software and in one evening I designed and purchased my mechanical parts. That ease and ability is so valuable to me that I want to use your company exclusively for my designs. I love the software too much to go elsewhere." "The parts are awesome! Definitely worth the wait. We also have many other parts we need machined and will be using eMachineShop for those also. You guys ROCK! Sincere Thanks." "This is the best, easiest-to-use drafting software I have ever used - please don't change a thing !!!!!" "My shipment is exactly what I expected. The piece functions flawlessly. eMachineShop is an excellent and super convenient service." "eMachineShop is my favorite website." "Just a short note to applaud this innovative concept! I may even be able to bring some of my long-dreamed about, but never attempted projects into the real world. This is an outstanding service. Incredible! Fantastic!" "Everything was very clean, all pieces were exact. I was so thrilled that I placed an order for something else, and I will continue to order from you. Keep up the great work." "We were very pleased with the quality of the parts. We thought the software was very easy to use & were impressed with the whole process. The parts turned out very nice and were packaged well. We will be ordering from eMachineShop again." "Thanks, using the eMachineShop software was easy, even for a novice. I was able to quickly design my part, select a finish and quantity and get a fair instant price quote. I look forward to getting the finished parts and hope the end result is as good as the remainder of the design and ordering process." "Everything looks fine, and within specifications. I am very pleased with the excellent job!" "I am in awe. Your concept is flawless... I have never been so delighted to find ANY website as I was to find yours. You have created an entirely new chapter in the Industrial Revolution. I now have the ability to bring my ideas and designs to fruition, all with the single click of the "Order" button. ... How thrilled I am, just contemplating the design and manufacturing possibilities you have made available to absolutely anyone who can operate a computer." 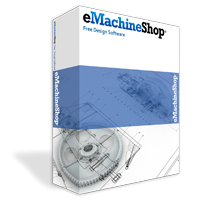 "As a professional CAD designer with over 15 years of CAD experience using nearly every software platform available, eMachineShop has, without a doubt, the most user friendly design package that I've ever encountered. Even my twelve year old can use this program. Accolades to eMachineShop." "I received my order and have to say that I am very impressed. The part looks exactly like it did on my computer screen. I will definitely be using eMachineShop again for any future projects." "I received my order today. I am VERY impressed with the quality of the cutting and bending. TOP NOTCH! I am 100% satisfied with the entire process.... from drawing the parts with your software to ordering electronically.... This is truly revolutionary when it comes to custom machined parts! Excellent job! I've turned on several friends - they say they'll be looking to you when the time comes for parts. I've got one more order that you are currently working on. I'm sure those parts will be just as perfect as the ones I received today. Thanks!"